Scottsburg High School was one of three schools in the state to place in three or more subjects areas at the 30th Annual Indiana Academic Super Bowl Area Competition, and for the fifth year in a row, the SHS Academic Team earned a state championship. “I’m very proud of this year’s team. 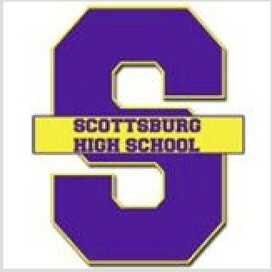 This is the best overall finish that the Scottsburg High School Academic Team has ever had. It didn’t just start this year — many of these students have been putting in a tremendous effort for multiple years and the results speak for themselves,” said Robert Deirth, science and interdisciplinary academic team coach, teacher, and science department chair. At this year’s state finals, the Academic Team won the state championship in the interdisciplinary subject area — a category that combines questions from all disciplines. The Academic Team was also the state runner-up in social studies, and the Academic Team placed third in science and had the highest science score of any school in southern Indiana. Both the social studies and science teams have had previous successes at the state finals with two consecutive state championships for the social studies team and one state championship for the science team. “The thing I will miss most is the feeling you get after winning the championship. It lets you know that all the hard work you have put in over the year has paid off. And afterward, you can breathe a sigh of relief, as those last few hours before competing are very nerve wracking,” said Evan Howser, senior and member of the social studies and interdisciplinary teams and captain of the English team. 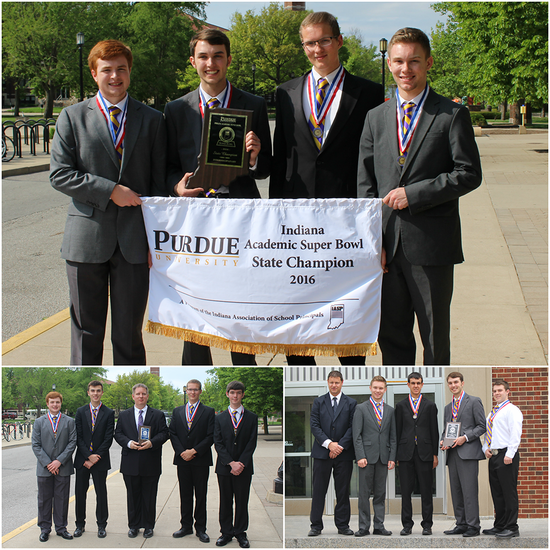 Along with the school history-making win at the state finals on May 7 at Purdue University, SHS was recognized by the Indiana Association of School Principals as one of the Top 10 teams. The elite distinction was based on the cumulative scores of all six rounds at the Area Competition. The scores earned at Area Competition determine what subject areas teams move forward to the state finals. “The best thing about being on the team is the opportunity to compete against other teams from across the state and show off everything we have studied and learned over the year. The most challenging thing is making sure that all the members of the team are on the same page. Sometimes, two members having a different interpretation of a single word can lead them to disagree on an answer,” Howser said. To prepare for the competitions, the student members of the Academic Team spend hours preparing during the spring. The members work together at after school meetings and at home, reviewing questions and reading resources. “I've always been smart. Every person on an academic team is smart. But I never really had any sort of work ethic until I joined the academic team. These competitions aren't about which team has the smartest people; they're determined by which team works the hardest. I've taken lots of classes where I could just coast and get an A. Academic team isn't like that,” said Jacob Cook, senior and captain of the science team and a member of the interdisciplinary team. At Scott County School District 2, the Academic Team’s story is our story. Your story matters. You matter. Two years after the football program returned at SHS, a senior football player has signed a letter of intent to play football at the collegiate level. Joshua Mihalik, a senior fullback and inside linebacker, is the first football player from SHS in more than 35 years to sign a letter of intent to play football at the collegiate level. For Mihalik, he will be attending and playing football in the fall at Wabash College in Crawfordsville. Wabash College is a National Collegiate Athletic Association Division III school. “Josh's signing with Wabash is significant for the SHS Football program because it provides motivation to our underclassmen, middle school and youth league players to work hard in the classroom, the weight room, and on the football field in order to follow in Josh's footsteps,” said Kyle Mullins, head football coach and teacher at SHS. Before Mihalik’s signing this week, SHS’s last football player to sign a letter of intent to play college football was Gordon Bayes in 1979. Bayes signed to play at Manchester University, formerly Manchester College, in New Manchester. In high school, Bayes was the co-captain of the football team, playing all four years of high school. He was All-Conference his junior and senior years and named Most Valuable Player his senior year. Bayes was also awarded the Purple Pride Award. Now at his senior year, Mihalik’s decision to sign at Wabash is rooted in his love for the game. While he will be playing at the college level, Mihalik’s sees one major change for next year — his father will no longer be his coach. For years, Mihalik’s father has coached him on the field in some capacity. Despite the changes, Mihalik is excited to attend and play at Wabash because of the school’s academic prominence and because of the reputation of the program. “Wabash College is a Division III powerhouse and will offer Josh a tremendous education. They had a 2015 record of 12-1 (9-0 conference record), losing only in the quarterfinals of the 2015 Division III tournament,” Mullins said. Since Mihalik is an academic honor student, he received the dean’s scholarship and other academic awards to attend Wabash. As a Division III school, Wabash cannot give athletic scholarships to their student athletes. “I hope those who are playing [at SHS] will see I got this due to my grades, not just my athleticism,” Mihalik said. “Josh has worked very hard to maintain high grades in order to be accepted to Wabash. 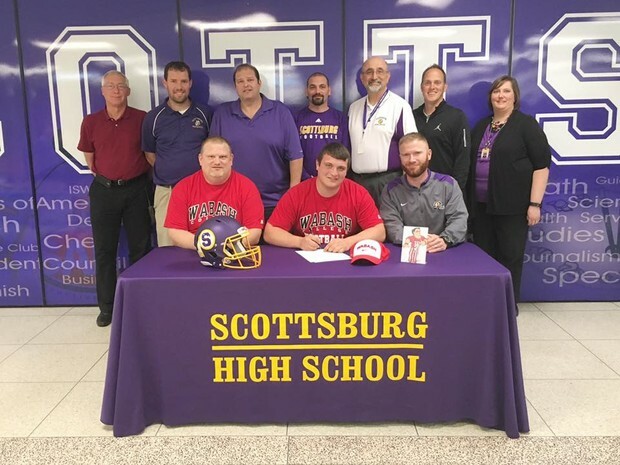 He will be a tremendous representative for Scottsburg Football and SCSD2 during his time at Wabash College and beyond,” Mullins said. At Scott County School District 2, Mihalik’s story is our story. Your story matters. You matter. Baseball, girls tennis, softball - each athlete is to bring a vegetable/covered dish. Boys golf, boys track, girls track - each athlete is to bring a dessert dish. The meal will begin at 6 p.m. The awards program will begin at approximately 7 p.m.
All teams will stay in the Commons during the awards presentation. Out of respect for the athletes on the other teams, please wait to leave until the end of the banquet. We would like to introduce the new FFA officers to SHS! Please congratulate these students!